The transformation of Tate St Ives completes in October 2017. A four-year building project which doubles the space for showing art, adding almost 600 square metres of galleries, and created spectacular new studios for learning activities. It gives the gallery enough space to accommodate the quarter of a million visitors it welcomes each year – over three times the number for which it was originally designed – who bring £11 million annually to the local economy. For the first time, Tate St Ives can provide a permanent presence to those iconic 20th century artists who lived and worked in the town, demonstrating the role of St Ives in the story of modern art. This is accompanied by a new programme of large-scale seasonal shows. The new Tate St Ives involved two major undertakings – refurbishing the original gallery and creating the new gallery and facilities. To refurbish the gallery and add the learning spaces, the architects, Evans and Shalev, who created the original Tate St Ives, were re-engaged to make the changes. 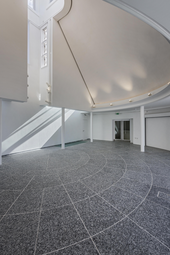 Many of the spaces throughout the gallery were improved and the Clore Sky Studio was added to the top of the gallery, which has become a crown to the building, thanks to its conical shape. To create the Clore Sky studio and refurbish the Foyle studio, the St Ives Studio and the reception area, significant demolition took place throughout the building and work took place on every level of the building. The original galleries can now be dedicated to a display exploring modern art in St Ives and its relationship with the wider world. It offers a chronological overview of 20th century art from the perspective of St Ives, including British and international artists from Ben Nicholson, Peter Lanyon and Barbara Hepworth to Piet Mondrian, Naum Gabo and Paule Vézelay. To extend the gallery, award-winning Jamie Fobert Architects were selected to design the significant four storey extension containing a vast new gallery lit by six huge skylights. It will allow Tate St Ives to stay open all year round for the first time, without the need to close each time the exhibitions change. With a public garden on its roof, connected to the cliff above and the beach below, the new building will also add a collection care studio, loading bay, staff offices and visitor facilities. Clad in handmade ceramic tiles with a blue-green glaze, the building is designed to reflect the changing colours of the sky and sea. To create this new gallery, it was necessary to dig into the hillside behind the original Tate St Ives. The lower floors of the staff area and the new gallery are all technically underground, but with sea facing views and an innovative rooflight system, the spaces are bright and spacious. During the digging, a very hard rock known as Blue Elvan presented a challenging drilling period. In the end, 922 lorry loads of soil and rock were removed to make way for the new Tate St Ives. During the project, Tate St Ives received funding from the Heritage Lottery Fund towards a cluster of learning programmes for both the staff at Tate St Ives and the local community. These come under the title ‘The St Ives Legacy Project’. It is a 4 year programme supporting staff training and internships as well as learning activities with local schools and the wider community across Cornwall including the Town Project and Look Groups. Tate would like to thank the organisations and individuals who have supported the new Tate St Ives, starting with a major gift from The Headley Trust, and including donations from the Clore Duffield Foundation, The DCMS/Wolfson Museums and Galleries Improvement Fund, The Foyle Foundation, The Ronald and Rita McAulay Foundation, Lord and Lady Myners of Truro, and the Garfield Weston Foundation. Providing a productive environment which values experimentation and risk, discussion and debate.